I have a slight addiction when it comes to holiday treats, deeming it almost impossible to eat and/or hand out all of it. So this year... Pre-Packaged Puppy Chow for all. 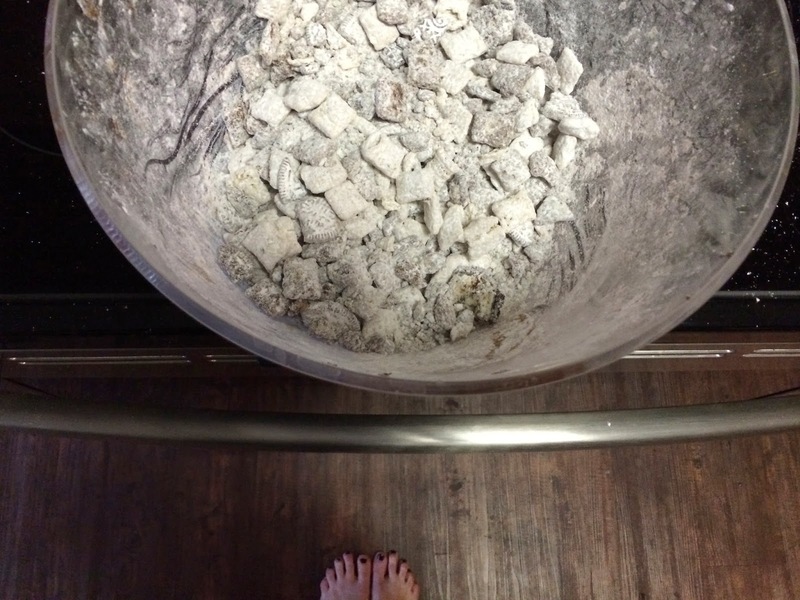 This puppy chow in particular, was the most different recipe I have tried thus far, but never the less... it was good. I chose to do the cookies and cream version, while adding Brach's Mellowcrème Pumpkins to give for a great Halloween disguised treat! 1. 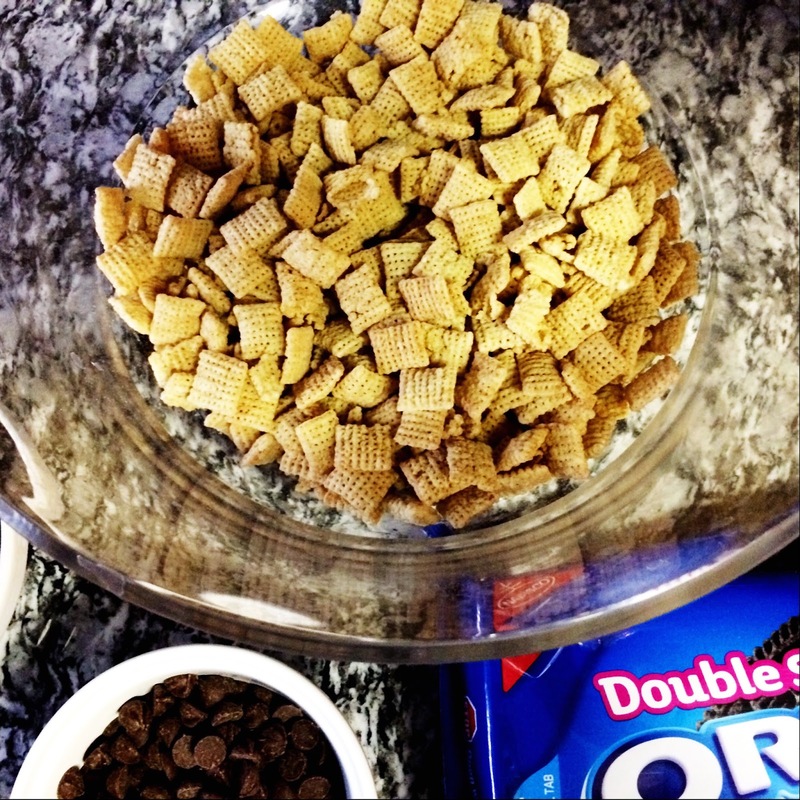 Divide the chex cereal into two bowls. Putting 2 1/2 cups of cereal in each. 2. In a food chopper (or a gallon baggie and wooden spoon) crush the Oreo cookies until they are fine. 3. 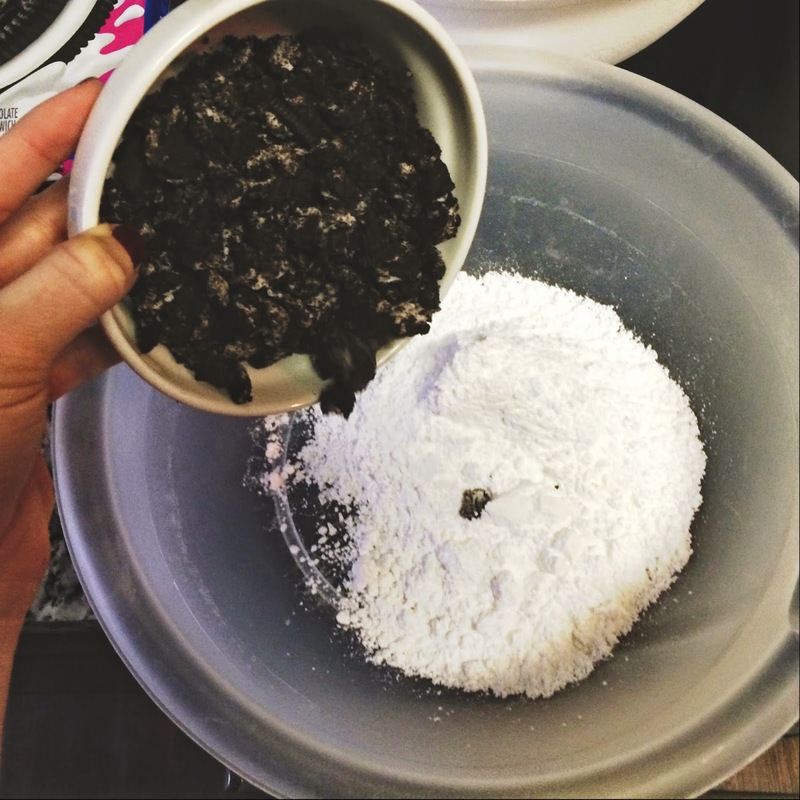 In two gallon size bags or two bowls, add 1/2 cup powdered sugar into each bag/bowl with 1/2 of the crushed Oreos into each bag. 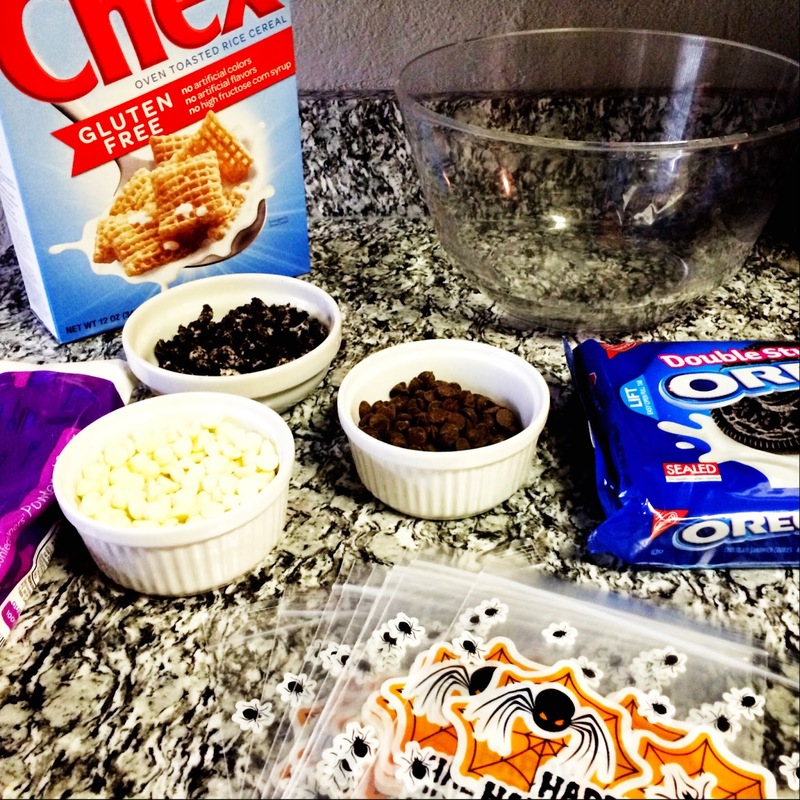 Allowing the Oreos to blend and create a perfect coating. Set aside. 4. Melt the white chocolate and milk chocolate in separate microwave safe ramekins. Melt 30 seconds at a time stirring after each 30 seconds until melted, remember the bowl will get warm, wear gloves or use a towel to protect your hands. 5. Once melted, stir in the white chocolate and milk chocolate into your separate bowls with Chex cereal until the Chex are coated well with the chocolate. 6. Add the white chocolate and milk chocolate coated cereal separately into the gallon sized bags with powdered sugar and crushed Oreo's then pour 1/2 of the pumpkins in each bag and shake until they are coated. Then add some extra crushed pieces to the mixture at the end. So... with all of this puppy chow... what are we too do? Gift it of course! So we made our little Halloween teats for the whole family this year! I might have gone overboard on the printable's but... Do you think people will notice when they receive a nice package in the mail, I think not! So to town we went! I used a few printables and turned them into stickers to seal the tissue paper around the package of Puppy Chow, I then tied a beautiful bow with white tulle to complete the look. 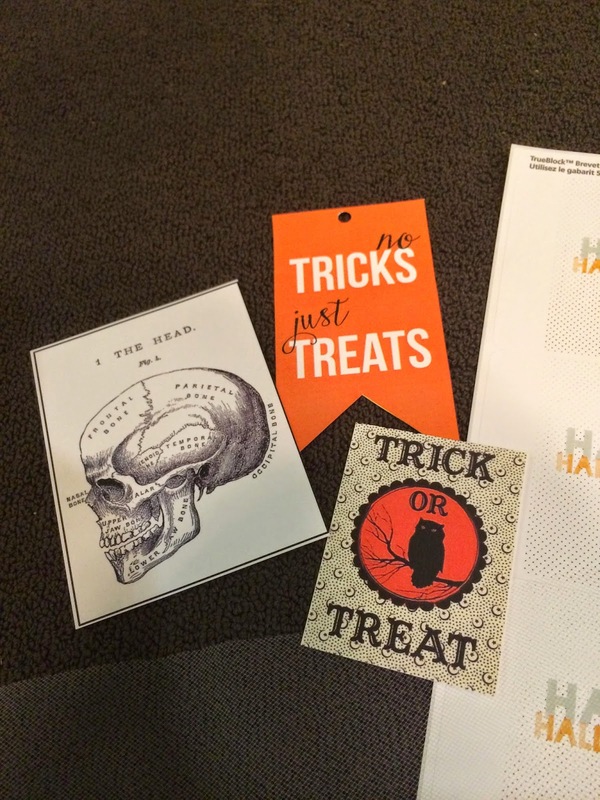 The no tricks, just treats printable just tied all of this together! 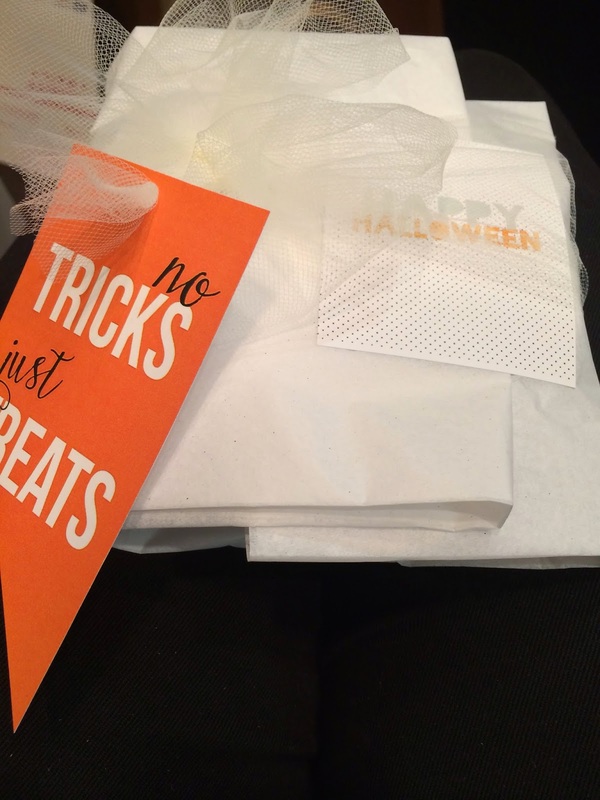 I then stuffed tissue paper into the boxes, placed the wrapped treats inside and filled with a few Halloween cards and notes for the recipients. Sealed the boxes shut and shipped off for the family to receive. 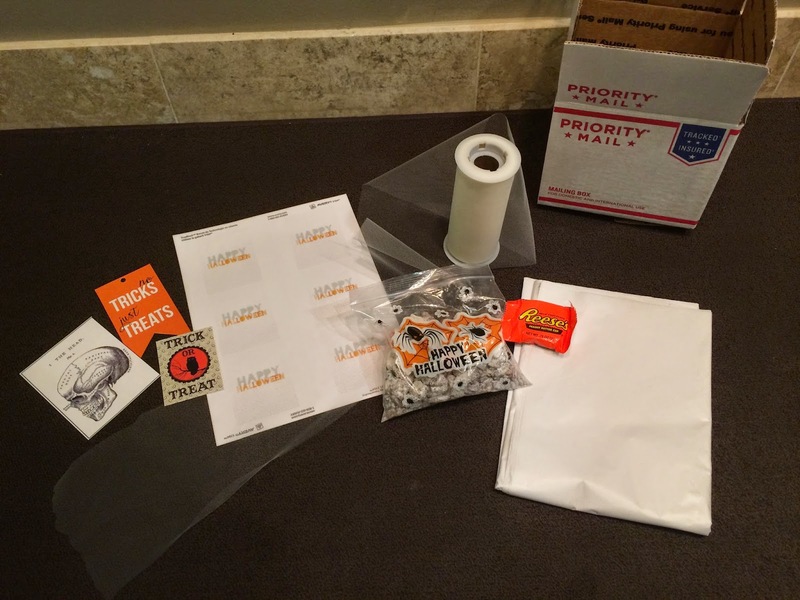 This Halloween treat was so fun to make, it was also fun to put together. Did you make and treats for family and friends this year! Let me know!